The office party was designed by mixologist David Nelson of IL Bistro in Seattle, Washington. It is one of the most interesting mixes of sweet, spicy, and tart that you will see in a tequila shot. In fact, it's so intriguing that you might want to skip the shot and enjoy it slowly as a savory mixed drink. 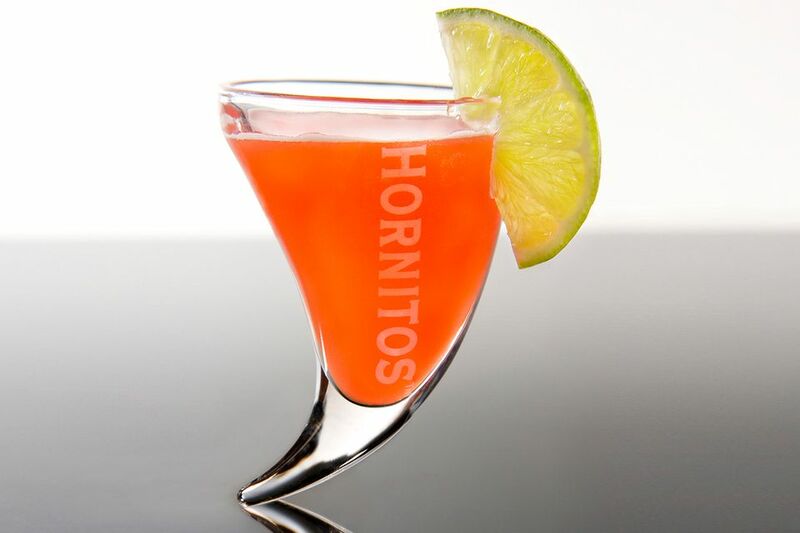 The recipe begins with the reposado tequila from Hornitos—a good tequila for crafty shooters like this—with lime, grenadine, and ginger syrup. That list alone sounds great, but the real kicker is the red bell pepper, which is muddled for its juices. With this singular ingredient, the drink comes together with a snappy taste that is unforgettable. While you have it, give the pepper juice a shot on its own... talk about a vitamin boost and potential hangover relief! Muddle the red bell pepper in a mixing glass to extract the juice. Add the remaining ingredients and fill the shaker with ice, then shake gently. Strain into two shot glasses and garnish each with a wedge of lime. This recipe yields around 4 ounces, enough to fill two tall shot glasses. Since it requires just a little more work to mix up than the average shooter, it's best when shared with a friend. You'll find it works out better to cut the bell pepper into thin slices as if you're preparing it for fajitas. Be sure to remove the seeds and white membrane. Take your time muddling the pepper and really put some muscle into it (it's not difficult, but not as easy as muddling fruit). You want to extract as much juice as possible out of it. Ginger syrup is easy to make at home. All you need is some sugar, water, and sliced ginger. You will need to let it cool and steep for about 1 hour, so plan ahead. If you really want a homemade drink, make your own grenadine as well. It's as easy as any other flavored syrup and can be made with pomegranate juice or the fresh fruit. This recipe is written to create a shot drink. If you strain it over fresh ice into a highball or old-fashioned glass, you'll have a very interesting sipper that rivals a Bloody Mary. How Strong Is an Office Party? Not only does is this one of the more intriguing tastes you'll find in a shooter, but it's also surprisingly light. Once mixed up, the office party's alcohol content should fall in the 15 percent ABV (30 proof) range. Go ahead and mix up a second round!